Dajin, is an early stage Lithium exploration company. Through its interest in Dajin Resources S.A. ("Dajin S.A."), it holds concessions or concession applications in Jujuy Province, Argentina that were acquired in regions known to contain brines with Lithium, Potassium and Boron values. These land holdings exceed 93,000 hectares (230,000 acres) and are primarily located in the Salinas Grandes and Guayatayoc salt lake basins (salars). San Jose/Navidad minas form part of the 93,000 hectare land package covered by the joint venture between LSC (51%) and Dajin (49%). LSC is the operator of the exploration project and is required to complete CDN$2,000,000 in expenditures. In Nevada, Dajin holds a 100% interest in 403 placer claims covering 7,914 acres (3,202 hectares) in the Teels Marsh valley of Mineral County, Nevada. These claims are known to contain Lithium and Boron values and are adjacent to the birth place of US Borax Corp's first borax mine. Dajin also holds a 100% interest in 278 placer claims covering 5,591 acres (2,262 hectares) in the Alkali Lake valley of Esmeralda County, Nevada, located 7.5 miles (12 kilometers) northeast of Albemarle's Silver Peak Lithium brine operation in Clayton Valley. Dajin is moving forward with construction of roads and pads at its Teels Marsh valley project in preparation for drilling of four (4) large diameter exploration wells. Lithium spot and contract price news - Lithium spot prices moved sideways, whilst 2018 global LCE contract prices are up about 20%. Lithium market news - Volkswagen's $25b battery deal helped boost sentiment in the lithium sector. Junior lithium miner company news - Nemaska Lithium, Kidman Resources, Neo lithium and AVZ all had strong results this month. Welcome to the March 2018 edition of the "junior" lithium miner news. We have categorized those lithium miners that won't likely be in production much before 2020 as the juniors, rather than market cap as that fluctuates too much. March saw some stock price recovery following the $25b battery deal between Volkswagen (OTCPK:VLKAY) and Samsung SDI (OTC:SSDIY), LG Chem (OTC:LGCEY), and Contemporary Amperex Technology Ltd [CATL]. The sector is still well down from its highs about 3 months ago, but looks to be stabilizing now with some stock price recovery starting. During March, 99.5% lithium carbonate China spot prices were little changed, and are down 1.44% over the past 3 months. 2018 Global Lithium Carbonate Equivalent [LCE] contract prices are up about 20% in the range of USD 13-16,000/tonne. Bacanora's recent news revolves around their plan to re-domicile the company from Canada to the UK, and also to change the company name to Bacanora Lithium. The company stated: "The new Bacanora Lithium plc shares ("Bacanora UK Shares") are expected to be admitted to trading on AIM at 8.00 a.m. (London time) on 26 March 2018." You can read the latest news here. Investors can view the company's latest presentation here. 2019/2020 - Plan to commence production ramping to 17,500 tpa, and in stage two 35,000 tpa. 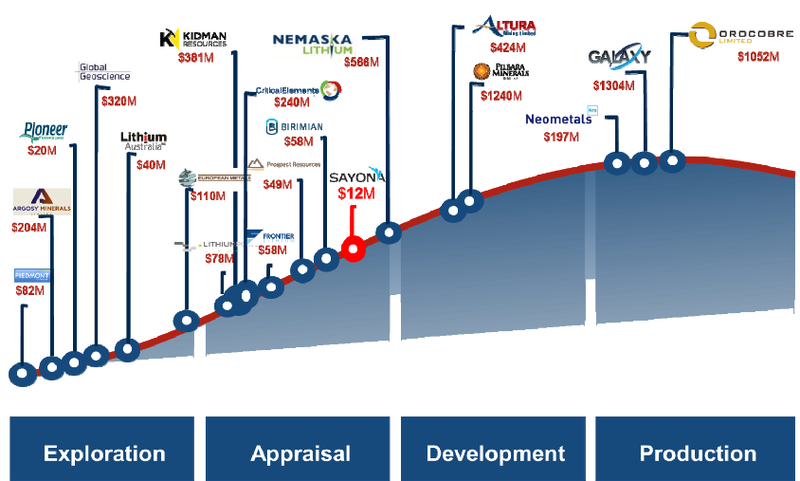 Nemaska Lithium: Advances in its lithium project financing endeavors. The Corporation has signed a non-binding term sheet for a USD 150 million streaming facility. it is currently in advanced discussions for debt financing aggregating USD 300-350 million. it intends to raise the remainder through private and/or public equity or debt offerings, hence its preliminary base shelf prospectus filed on www.sedar.com yesterday. You can read more on my article on Nemaska Lithium here, and the latest company presentation here. 2018 - Off-take agreements and project financing announcements. 2020 - Possible production start. On February 27 Critical Elements announced: "Agreement with the #Cree Nation of Eastmain and @Niskamoon Corporation for the implementation of the Eastmain River Lake Sturgeon spawning ground enhancement project." Investors can read my article, "Critical Elements - A Lithium Miner With An Exceptional Buying Opportunity", written when the stock was at CAD 0.56. H1, 2018 - Rose stage 2 Feasibility Study due. 2018 - Project financing announcements, potential resource upgrade. 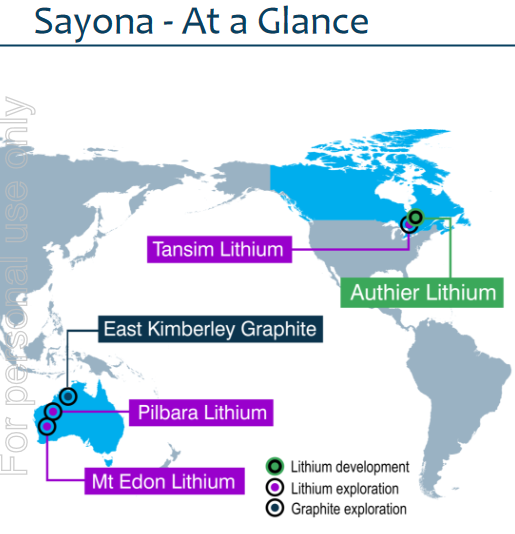 On March 20 4-traders reported, "Sayona Mining Ltd geophysics confirm targets for identifying new pegmatites at the Tansim lithium project in Quebec, Canada." Investors can also read a recent Independent Investment Research report here, with a price target of A$0.102. Investors can read the company presentation here, and my recent interview "Sayona Mining CEO Corey Nolan Talks With Matt Bohlsen Of Trend Investing." 2018 - Drill results for Authier Lithium Project. Q2 2018 - DFS to be released for Authier. 2020 - Production could begin. Argosy has an interest in the Rincon Lithium Project in Argentina, targeting a fast-track development strategy. Rincon Lithium Project update. Lithium brine concentrate processing via Stage 1 pilot plant expected to commence this week. Construction works commenced for additional Stage 2 lithium brine evaporation ponds at Rincon. Preliminary Economic Assessment works on-going. Arrangements made with major international customers to provide samples of battery grade LCE for quality specification. Investors can view the company's latest investor presentation here. AIS Resources is a Canadian junior lithium explorer and developer fast tracking towards production at their 100% optioned to own flagship Guayatayoc Laguna in Argentina. The company also has other Argentina lithium projects at Vilama salar and Quirón Salar. A.I.S. Resources provides corporate update. A.I.S. Resources Limited is pleased to announce final interpretation of geophysics at Chiron. The company’s fundamentals have not changed, but improved, and it remains on target with its timelines to become a lithium carbonate producer in the first quarter of 2020. The TEM (transient electromagnetic survey) testing has detected substantial aquifers over a broad area at its Chiron Project in the Pocitos Salar, Salta Province, Argentina. The company will next commence drilling at Chiron (Salar de Quirón - Pocitos tenements), thereafter drilling at Guayatayoc, and a maiden resource all within the next ~4-6 months, followed shortly by a Feasibility Study. Investors can read my article on Trend Investing "AIS Resources is racing towards lithium production in Northern Argentina", or my Chief Operating Officer Phillip Thomas interview here. H1 2018 - Drill results from Guayatayoc and Chiron. Late 2018 - FS for Guayatayoc and/or Chiron. 2020 - Plan to commence lithium production, initially 8,000 tpa, later 16,000tpa plus. 2017 news has included the 50/50 JV with SQM for the Mt Holland Lithium project, and a proposal for a refinery located in WA. Substantial increase in Earl Grey Mineral Resource estimate. 54% increase in Earl Grey combined Mineral Resource Estimate. Estimated to contain 189 million tonnes of 1.50% Li2O or 7.03 million tonnes of Lithium Carbonate Equivalent. 91% of Resource classified as Measured or Indicated. Confirms Earl Grey as one of the world’s most significant hard rock lithium deposits. Expected to be at the low end of the global hard rock cost curve. JV activity progressing rapidly; proposed refinery site to be announced. in next quarter. High level of interest from various parties seeking lithium hydroxide off-take. You can view a January Blue Ocean Equities presentation here, and a Hartley's broker report with an AUD 1.71 price target here. 2018 - PFS release expected. 2021 - Commence lithium production. Response to statement of Czech minister of Industry & Trade. All Company rights are derived from the current Czech legal system, notably the Geological and Mining Act, not the MoU. Any termination of the MoU would not in any way affect the exploration rights of the Company or the Company’s tenure over its exploration permits and the Company continues to progress the project with ongoing metallurgical testwork, discussions with offtakers and preparations for feasibility drilling underway. On March 28 European Metals Holdings announced: "Lithium recoveries improved to 95%." Investors can view the company's September presentation here. Late 2018 - DFS to be released. Mid 2019 - Bankable Feasibility Study to be released. Late 2021 - Production to commence. Investors can read my June 2017 article on European Metals Holdings here, or view the company's September presentation here. Neo Lithium achieves major milestones in brine processing, plant location and fiscal stability. Processing studies at the project have achieved concentration levels of 3.8% lithium brine solely through solar evaporation - no costly additives were required. MOU was signed with the government of the town of Fiambalá with respect to the location and building of a lithium carbonate plant. Federal Government has granted 30 years of fiscal stability for the project, including preserving various taxes at current rates as well as other incentives and benefits. Pilot scale pond construction has commenced in order to feed the pilot plant that is to be delivered to the project in Q3, 2018. New drill results will be available imminently. Investors can read my article "Neo Lithium Corp. Has Great Potential", back when the stock was at CAD 1.09. Investors can read the January 2018 company presentation here, and an excellent video here. My CEO interview is available on Trend Investing hereand is a great read. The company presentation has some nice graphs comparing various lithium brine projects. Q2 2018 - Updated resource estimate. Q4, 2018 - Definitive Feasibility Study. Project financing discussions. 2019 - Construction planned to commence. 2021 - Lithium production to begin. Birimian’s projects include the Goulamina Lithium Project, the advanced Massigui Gold Project, and the Dankassa Gold Project, all situated in southern Mali. Cost optimisation delivering significant savings - Goulamina. Outcomes expected to have a very significant benefit on Goulamina Project economics, with Goulamina C1 costs now reasonably expected to be below US$300/t." You can view the company's November 2017 presentation here. Maricunga lithium project awarded key regulatory export licence. The Chilean Nuclear Energy Commission (CCHEN) has awarded a key regulatory export licence for the production and marketing of lithium from LPI’s 50%-owned Minera Salar Blanco (NYSE:MSB) joint venture for a period of 30 years. The approval permits the initial extraction quota of 88,885 metric tonnes of lithium metal contained in brine or 472,868 tonnes of lithium carbonate equivalent (LCE). The CCHEN can increase the approved extraction quota upon MSB advancing the deep drilling exploration program scheduled for 2018. The extraction quota may also be increased by improvements in efficiencies at the production facilities." Investors can read my article, "Lithium Power International Has A Very High Grade And Expanding Lithium Project In Chile", as well as my CEO interview on Trend Investing here. Q4 2018 - DFS to be released. On March 5 Advantage Lithium announced, "Cauchari JV program update positive pumping test results - CAU07 NW Sector 601 mg/l Lithium in 48 hour pumping test, well pumping capacity to 36 l/s." Millennial has tenements at the Pastos Grande Lithium project and the Cauchari East lithium project. Millennial Lithium Corp. provides update of activities for its Pastos Grandes and Cauchari East projects, Argentina. Farhad Abasov, President and CEO of Millennial commented “Millennial is now well funded with approximately CDN $65,000,000 in its treasury allowing us to fast track our pilot studies and the exploration work on the Remsa ground. Millennial has a strong technical team in Argentina which is expected to expand in the coming months to undertake pond construction and pilot plant construction and commissioning. A Feasibility Study will commence in Q2 2018 and we look forward to continuing to develop and advance the Pastos Grandes Project. You can view the company's latest investor presentation here. H1 2018 - PEA to be released. LSC Lithium is focused on six development stage lithium projects: Pozuelos, Pastos Grandes, Salinas Grandes (Salta), Salinas Grandes (Jujuy), Rio Grande and Jama. LSC Lithium Corporation (51%) has partnered with Dajin Resources (49%) for some tenements primarily located in the Salinas Grandes/Guayatayoc salt lakes basins, Argentina. On March 5 LSC Lithium announced, "LSC Lithium files technical report with Mineral Resource Measured and Indicated of 1,296,000 Tonnes LCE and Inferred 497,000 Tonnes LCE at Pozuelos." LSC Lithium announces Jama seismic survey indicates size of Jama potentially ~5,400ha and pre-engineering work on Pozuelos-Pastos Grandes project commences. Salar surface area extended under adjacent alluvial fan from 2,900ha to 5,400ha. Seismic data indicates the Jama Salar is developed up to 300m below surface. Mobilisation of drill rigs to Pozuelos and Pastos Grandes ongoing. Q2 2018 - An updated NI 43-101 Mineral Resource on Salinas Grandes. 2018 - PFS (Pozuelos and Pastos Grandes). Pure Energy Minerals provides update on Clayton Valley Lithium project. After announcing its intent to proceed with a pilot plant in Nevada to achieve several objectives on the path to a feasibility study (see Company news release dated October 11, 2017), Pure Energy has been working closely with several engineering providers to achieve the basic engineering and final design of the plant. Basic engineering of the pilot plant is expected to be completed during the second quarter. You can read the company's latest presentation here. Early 2018 - Maiden drilling at the Terra Cotta Argentina Project. On March 6 AVZ announced, "AVZ Minerals hits 282.95m* of spodumene bearing pegmatite at Manono Lithium project." AVZ signs Memorandum of Understanding with Guangzhou Tinci Materials Technology Co. for potential investment and off-take. Tinci is the largest battery electrolyte manufacturer globally and supplies a substantial portion of the global battery electrolyte market. AVZ signs Memorandum of Understanding with Beijing National Battery Technology Co., Ltd for potential investment and off-take opportunities with the Company. Beijing National Battery Technology Co., Ltd is headquartered in Beijing, China, and holds the dominant market position for the supply of batteries to China's bus industry. 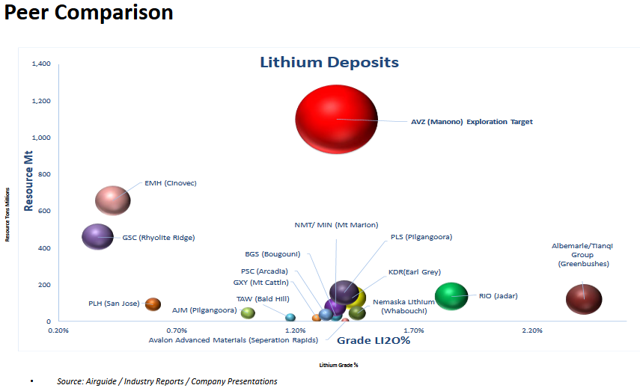 The chart below compares the lithium spodumene projects by resource size (note AVZ uses an "exploration target") and grade. It does show the potential of AVZ's Manono lithium project. Second in size is EMH (European Metal Holdings), noting they have a lower grade (partially offset by tin by-product). You can view the November company presentation here. Q1 2018 - Drill results and maiden resource estimate. Q4 2018 - DFS due. Wealth Minerals has a portfolio of lithium assets in Chile, such as 46,200 Has at Atacama, 8,700 Has at Laguna Verde, 6,000 Has at Trinity, 10,500 Has at Five Salars. Wealth enters strategic alliance with the National Mining Company of Chile – ENAMI. The Agreement contemplates that the JV will take the form of an incorporated joint venture company in which ENAMI will own 10% of the JV and have a 10% free-carried interest, while Wealth will own the remaining 90% of the JV. The Agreement provides that the parties will have 24 months to enter into a definitive agreement that will govern the formation and operation of the JV. Piedmont Lithium state they are "the only US lithium spodumene project", with their 100%-owned Piedmont Lithium project in North Carolina. The company has already identified a 4+ kilometers of strike length in Phase 1 drilling, with high-grade lithium in every drill hole. Drilling is ongoing to define and increase the resource. On March 5 Piedmont Lithium announced, "Piedmont Lithium continues to expand its first mover land position in North Carolina, USA." On March 14 Piedmont Lithium announced, "Piedmont continues to define high grade lithium mineralisation in North Carolina." Q1 2018 - A full North American share listing. Q2 2018 - Maiden JORC resource estimate. Q3 2018 - Scoping Study results to be announced. You can view the company's latest presentation here, and a January 2018 Fosters Stockbrokers report here. Fosters price target is US$ 0.30, speculative buy. Nano One granted Canadian process patent. This is Nano One’s sixth patent and is directed at a method for forming a mixed metal powder, particularly for use as a cathode material in next generation lithium ion batteries. Other juniors include: ABE Resources [TSXVABE] [GR:1AJ2] (OTCQB:ABEPF), American Lithium Corp. [TSX-V: LI] (OTCQB:LIACF), Argentina Lithium and Energy Corp. [TSXV: LIT] (OTCQB: OTCQB:PNXLF), Avalon Advanced Materials [TSX:AVL] [GR:OU5] (OTCQX:AVLNF), Far Resources [CSE:FAT] (OTCPK:FRRSF), Force Commodities [ASX:4CE], Hannans Ltd [ASX:HNR]), Lake Resources [ASX:LKE] [GR:LK1], Latin Resources Ltd [ASX: LRS] (OTC:LAXXF), Lithium Australia [ASX:LIT] (OTC:LMMFF), Lithium Chile [TSXV:LITH] (OTCPK:LITH), MetalsTech [ASX:MTC], MGX Minerals [CSE:XMG] (OTC:MGXMF), NRG Metals Inc. [TSXV:NGZ] (OTCQB:NRGMF), Plateau Uranium [TSXV:PLU] [GR:QG1A] (OTCQB:PLUUF), Portofino Resources Inc.[TSXV:POR] [GR:POT], Prospect Resources [ASX:PSC], Savannah Resources [LSE:SAV] (GR:AFM], and Standard Lithium [TSXV:SLL] (OTC:STLHF). The juniors are a higher risk and higher reward area. We have tried to put them mostly in order of development stage, to help investors easier understand the junior lithium mining sector. It has been another tough month for the lithium junior miners with only sporadic signs of recovery. The juniors continue to progress well, so we expect we will soon see some stock price recoveries. Nemaska Lithium signing a non-binding term sheet for a USD 150 million streaming facility. Kidman Resources - "Substantial increase in Earl Grey Mineral Resource estimate. Estimated to contain 189 million tonnes of 1.50% Li2O or 7.03 million tonnes of Lithium Carbonate Equivalent." "Neo Lithium discovers deep aquifer with high grade lithium. New drill hole intercepted 512m with average 638mg/L Lithium." AVZ "hits 282.95m* of spodumene bearing pegmatite at Manono Lithium project." AVZ signing not one, but two MOUs - Guangzhou Tinci Materials Technology Co and Beijing National Battery Technology Co.
MiningNewsReporter.com is a subsidiary of Target Publishing Inc, and is a leading publisher of todays market and investment news, commentary, proprietary research and videos from seasoned journalists, analysts and contributors covering the financial markets and global economies. Leveraging our extensive distribution network and social media presence, we have cultivated a valuable audience of engaged market enthusiasts, which in turn delivers a variety of unique opportunities for industry partnerships, corporate communications, market exposure and investment. We have been paid cash only for this report . We do not take shares in payment for our work .